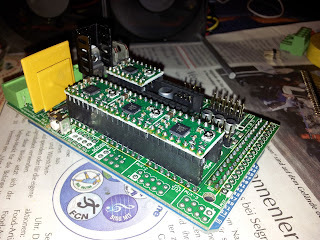 Today I mounted the build platform, to check for dimensions and fit of the heated build plate PCB. Looks good. 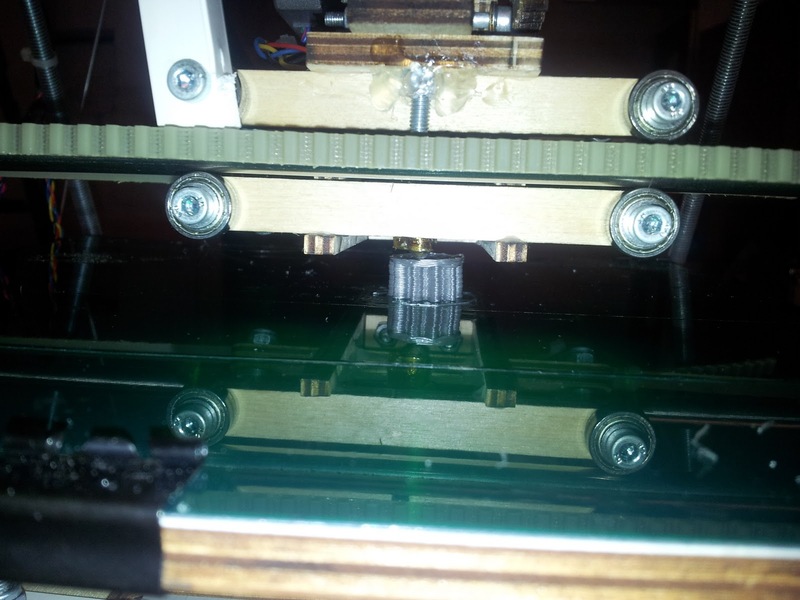 I need to increase the diameter of the mounting holes to compensate for the thermal expansion of the heat bed PCB. I am still looking for a viable insulator material between the heat bed and the wooden carrier plate. Also, I need some good idea on how to mount the glass pane onto the build plate. As a first result, the Y-axis actually is moving. Well, kind of. As Kliment already pointed out, the steppers are too weak. It was worth a try. I now ordered steppers with .43 Nm torque. This should suffice. Until they arrive I will have to figure out how to fasten the tiny T2.5 pulleys on the 5mm stepper shafts. Tomorrow I'll print some more plastic parts. 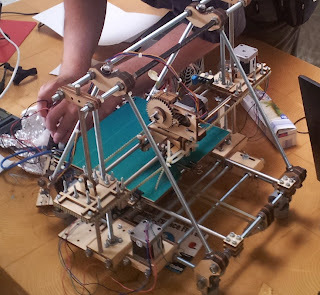 This is a wooden RepRap Mendel made from laser-cut plywood. It was built over the course of several months by members of AUGE e.V. Frankfurt and Hackerspace FfM. While being cut very precisely the plywood changes shape and volume according to temperature and humidity. 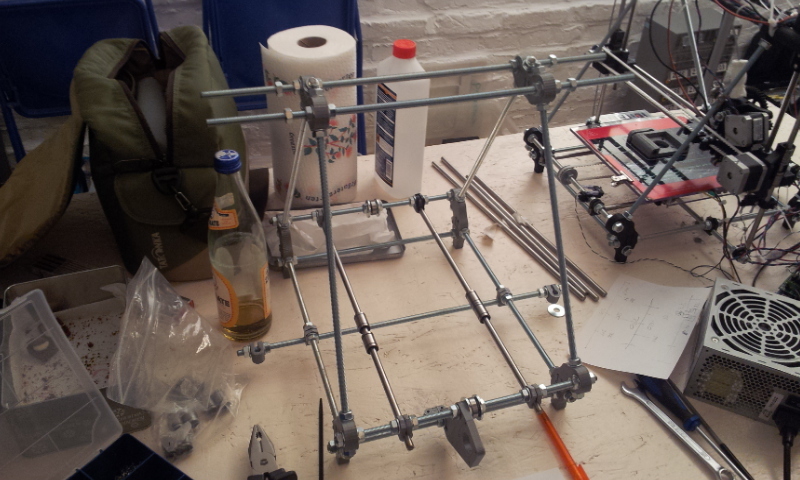 This means that adjusting the whole system from bearings to zero-points of the axes is imperative before printing. 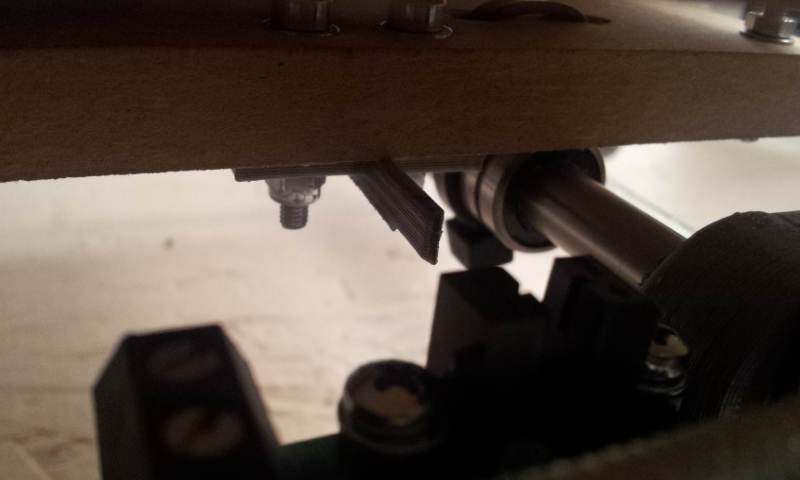 The mechanics of the extruder also showed heavy wear after a few printing sessions. 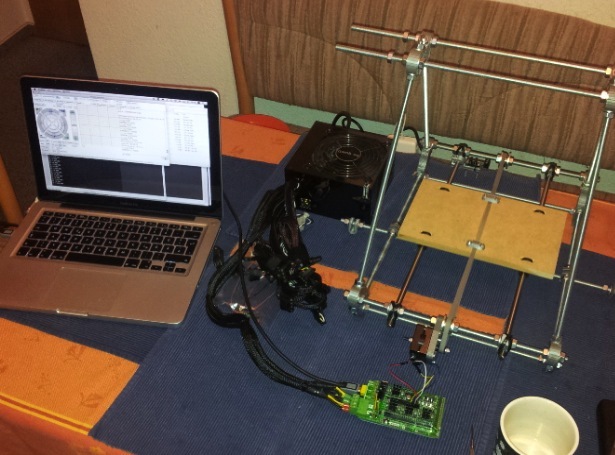 The electronics used are RepRap Gen3 with serial extruder controller board. 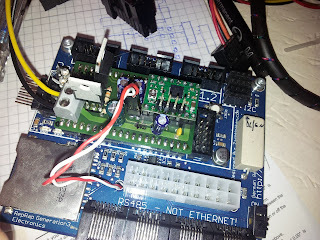 Driving the extruder via the second controller over a serial link using non-shielded cabling introduces several sources for malfunction to the system. 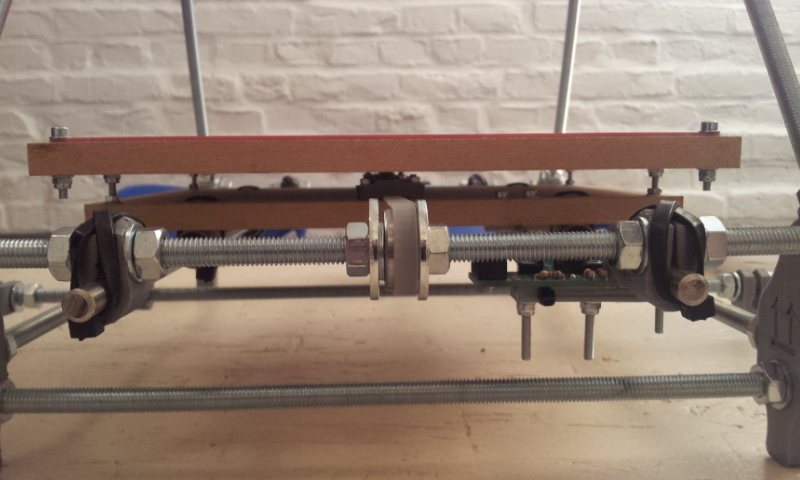 Furthermore, being controlled over a serial protocol, the extruder produces stalls in movement of the X and Y axis when the main controller needs to wait for the extruder to complete commands. I solved this via Kliment's excellent Gen3+ that integrates two input channels for thermistors, two MOSFET-driven power outputs and a Pololu Stepper Module (Allegro A4988) onto the main Gen3 electronic board. Running this controller configuration with the Sprinter firmware yields usable results. 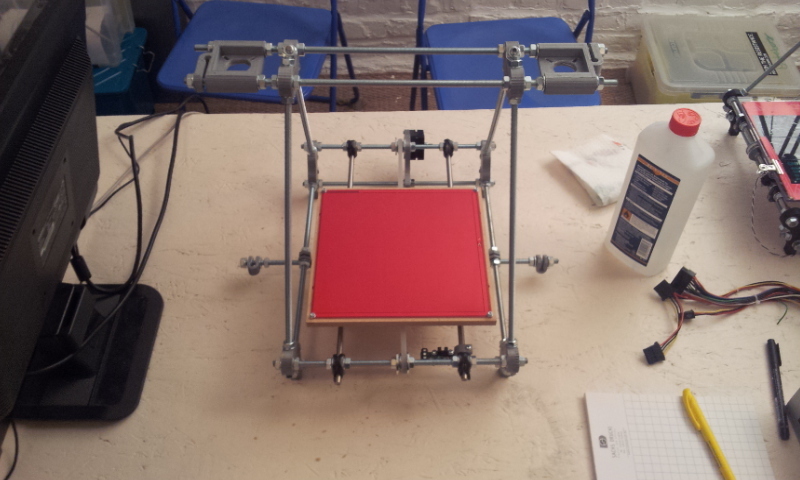 The wooden Mendel was then commisioned for printing stuff at the Hobby&Elektronik fair in Stuttgart. I am following the development of RepRap since quite some time now. 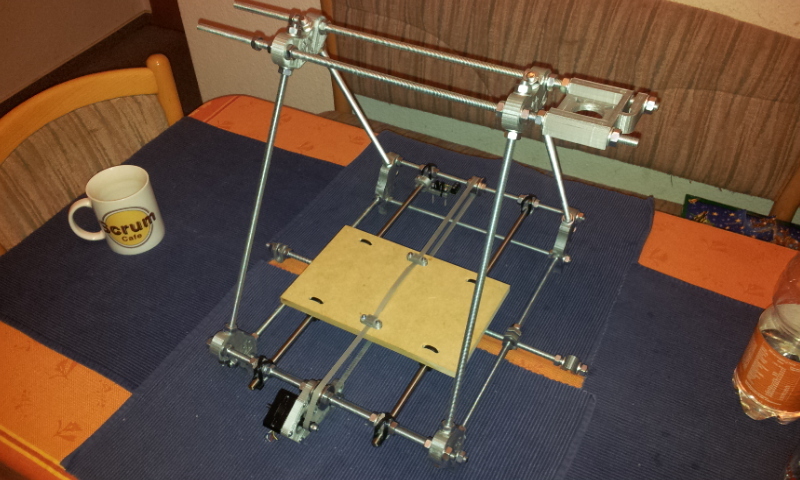 Being a member of Hackerspace FfM, thus having access to some tools and resources I do not have at home, I decided to build a Prusa Mendel earlier this year. 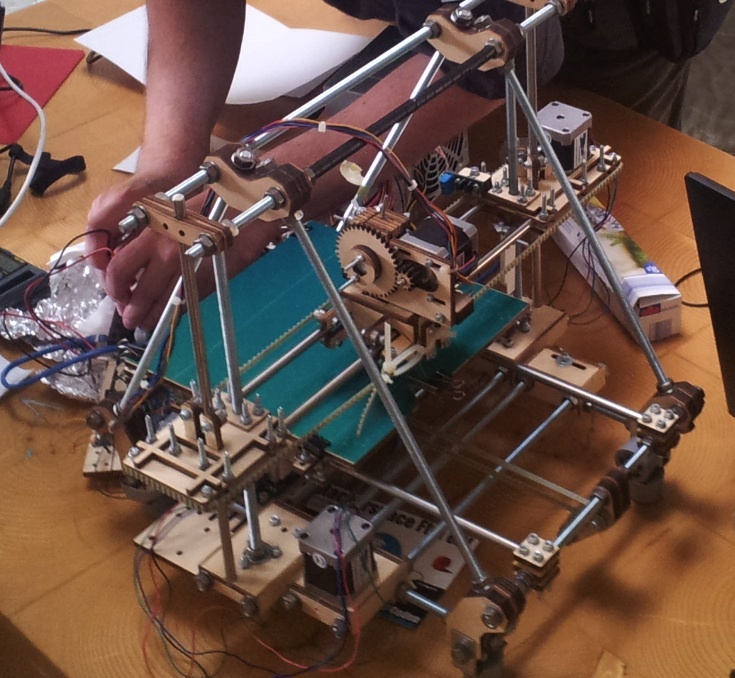 Coming up: some documentation on how the machine is coming to life.